I’ve just returned from a weekend at the Paris Bookfair. 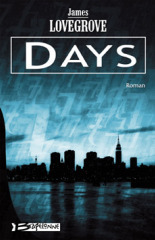 As you may be aware, a French edition of Days has just been published, and seems to be going down a storm on the other side of the Channel, having received glowing reviews and garnered positive comparisons to Ballard, whom the French of course love. Lou, Monty and I stayed in the city as guests of that fine publishing company Bragelonne, and the weather was beautiful (springtime Paris in all its glory) and the personal welcome no less warm. Monty even had time for a brief amour with a lovely young thing called Celine in the sandpit at the Jardin du Luxembourg. Their eyes met across the bucket and spade and they gurgled sweet nothings to each other in the universal gobbledygook esperanto of toddlers. 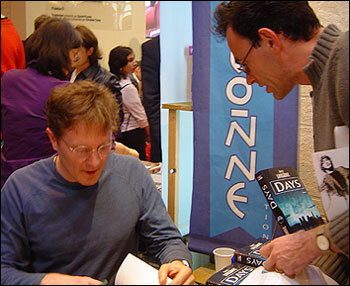 Me, I was hard at work doing signings and being interviewed by journalists, including one from Le Monde and one from Liberation, French equivalents of the Times and the Guardian. I also was able to drool over the huge quantity of lovely-looking bandes desinees on sale at the bookfair, even though, with my painfully impoverished French-language skills, there was no point in me buying any. I’d like to express my immense gratitude to Alain Nevant and everyone else at Bragelonne for looking after the three of us so well. It was a wonderful trip. Coming back to England and the proper business of actually writing was like coming down to earth with a bump. However, those works of fiction don’t just compose themselves, you know. On the short-story front, may I direct your attention to the following recently-published anthologies to which I have contributed tales? The first is The Mammoth Book of New Jules Verne Stories (edited by Mike Ashley and Eric Brown, published by Robinson in the UK and Carroll and Graf in the US) which is a wonderful and — the title doesn’t lie — very large assemblage of homages to the French SF grandmaster, the hundredth anniversary of whose death has just passed. Most of the stories are offshoots of original Verne works, or else, like mine, ‘Londres au XX1e siecle‘, unofficial sequels thereto. It’s a lovely, thick, compendious collection, and a fitting tribute to the great man. Second up is Constellations (edited by Pete Crowther and published by Daw) which is the third in what nobody but me is calling Pete’s Solar System Sequence, following on from Moon Shots and Mars Probes. The theme of this particular volume is – you’ve guessed it! – constellations, and Pete has gathered new tales from a veritable who’s who of contemporary British SF authors, and me, to create not only a hugely varied and enjoyable book but also a tasty sampling of the current, thriving, multidenominational church that is British SF (ghastly mixed metaphor, sorry, but who says you can’t eat a church?). My contribution, ‘The Meteor Party’, is a meditative earthbound effort that sits strangely well alongside excellent out-of-this-world tales by the likes of Eric Brown, Roger Levy and Adam Roberts. Finally, I have yet another new tale, to be found at Paul Brazier’s recently-come-onstream site, Quercus. ‘The Last Change’ is one of my curmudgeonly, isn’t-technology-overrated? fictive grumbles which got a lot of psychic pus out of my system and is also, I like to think, quite poignant and funny.